Already for 61 years summer camp in "Sidrabene" has been an integral part of Latvian society in Canada. The owner and operator of “Sidrabene” is Toronto St. Andrew's Lutheran Church congregation. All the years of exile "Sidrabene" has been the source of Latvian culture and inspiration for thousands of Latvians in North America. 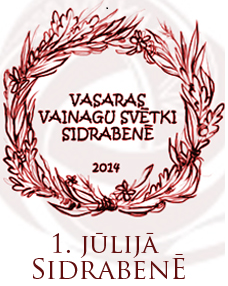 Also this year, in "Sidraben" will be celebrated "Summer Solstice festival” on June 28, And on July 1 there will take place "Festival of Summer Crowns 2014 " where all gests will be delighted by Latvian songs and dances performed by folk group "Svātra". As an integral part of the program will be the dance of summer crown.